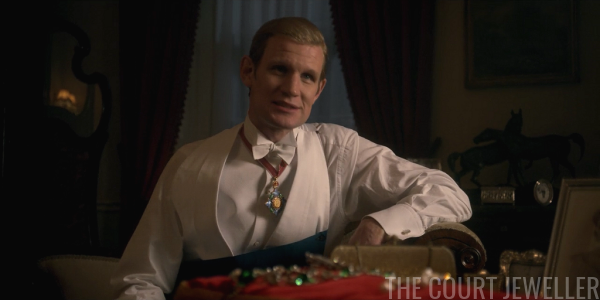 It's that time again, magpies: season two of The Crown has officially debuted on Netflix, and I've got our first bejeweled recap of the new batch of episodes. (Going forward, we'll have recaps on Tuesdays and Thursdays, so look out for episode two on the 14th!) 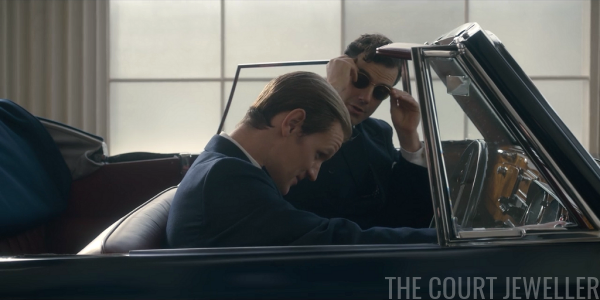 We've got jewelry, royal tours, and plenty of marital strife on the docket for today, so grab your popcorn and settle in for my recap of the jewels and history of "Misadventure." We open with a timestamp that notes that it's February 16, 1957. Phil and Liz are docked in Lisbon aboard the Britannia. Phil helpfully signals that there are strains in the marriage by opening the season stretched across a couch like Don Draper in the Mad Men credits. The two of them bark at each other about their marital problems. 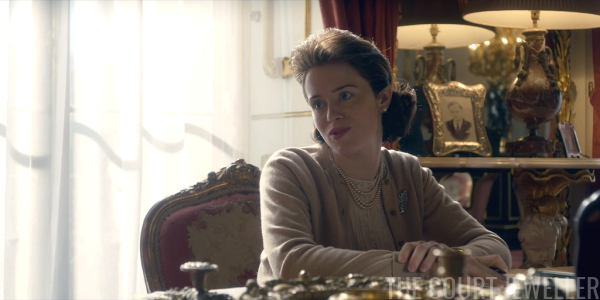 Wearing her "I am the Queen" uniform -- pearls and a diamond brooch -- Elizabeth bargains with her husband about preserving their troubled union. 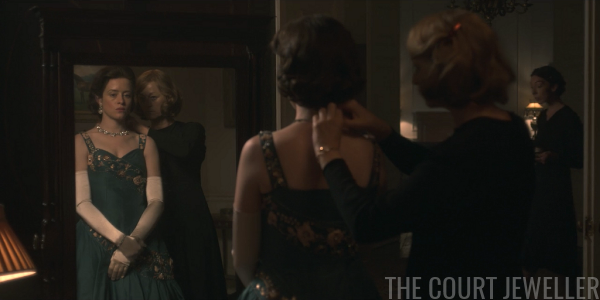 And then we flash back to "five months earlier," where Elizabeth is getting all jeweled up for the annual diplomatic reception at the palace. Get ready to be absolutely flummoxed by the timelines in this episode, both historically and in terms of the established plot. 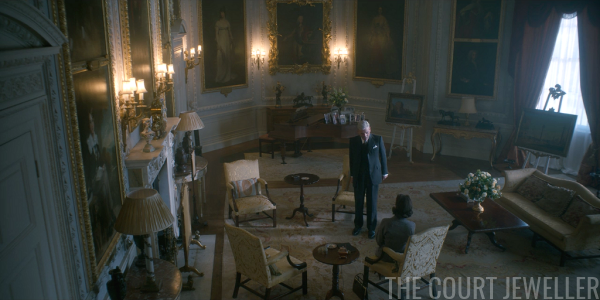 At the end of last episode, which took place in October 1955, a grumpy Duke of Edinburgh agreed to go on a lengthy royal tour "in November." 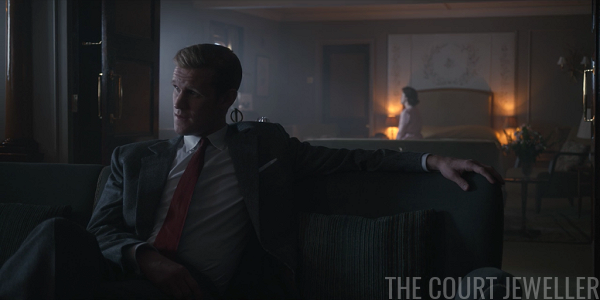 But now, it's September/October 1956, and Philip still hasn't left. Have we lost an entire year? 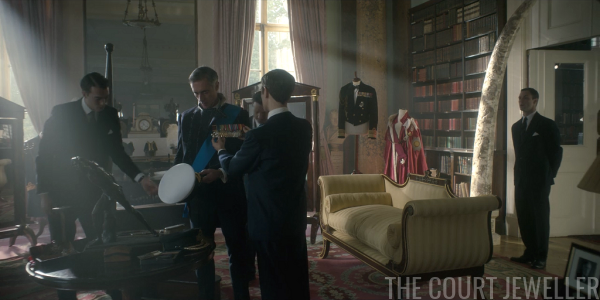 Philip is also all gussied up for the reception, wearing the Garter sash 'round his middle and the Order of the British Empire at his neck. 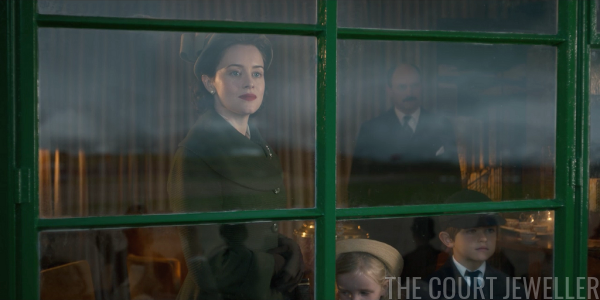 And am I right -- don't those look like the show's version of the Cambridge emeralds lurking in the foreground of the shot? Elizabeth happily discusses Philip's upcoming tour, and lets him know that she's grateful that he's going. 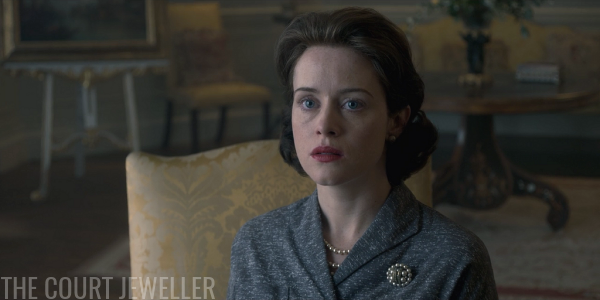 The replica jewels aren't terrible in this scene. 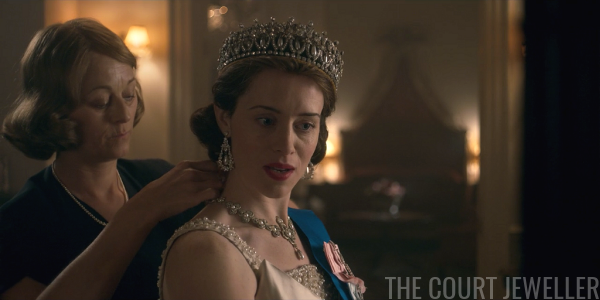 There are scale issues with the Lover's Knot Tiara, but the Gloucester Pendant Earrings, Queen Victoria's Golden Jubilee Necklace, and Queen Mary's Chain Link Bracelet all look fairly close to the real thing. Everybody's absolutely thrilled to be schmoozing with the diplomatic corps on a weeknight. 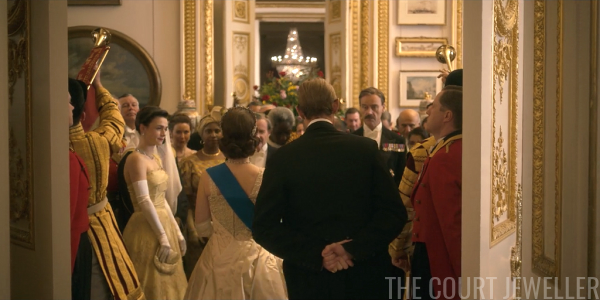 Note that HM is also wearing a pearl cluster brooch in this scene -- perhaps an oversized version of the top of the Duchess of Cambridge's Brooch? 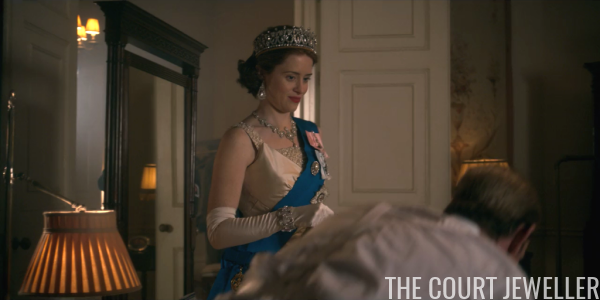 But Elizabeth can't help but smile at Philip's compliments (he tells her she looks good in "full battle dress" these days) and the little kiss he sneaks when everyone isn't looking. Things aren't so good on the diplomatic front in Egypt, however: it's Suez Crisis Time. 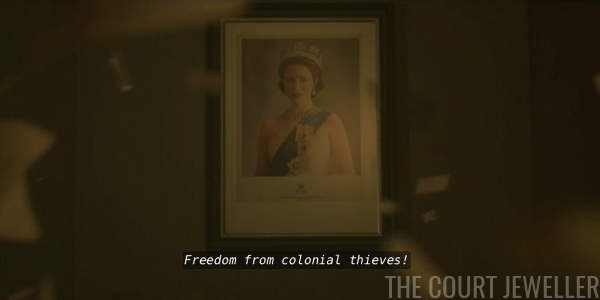 President Nasser nationalizes the Suez Canal and orders his soldiers to seize the company offices, which leads to this dramatic scene in front of the Gloriana portrait from the end of the last episode. The dialogue/image juxtaposition is very subtle, clearly. 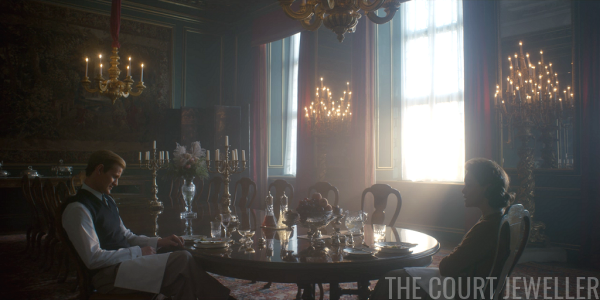 Elizabeth is less Gloriana and more Mrs. Mountbatten the next morning, when she finds herself on her husband's side of their bedroom suite wearing only her engagement and wedding rings. Later in the day, Elizabeth makes eyes at a picture of Philip as she writes a note for him to take along on the royal tour. 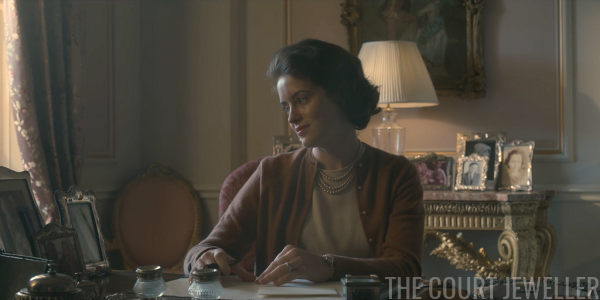 She's wearing her "casual queen" daytime uniform: pearls with a cardigan, but no brooch. Meanwhile, Prime Minister Anthony Eden addresses the students of his alma mater, Eton, encouraging them to continue reinforcing the rigid "good old boys" class and social structures of the British government. His "more Etonians in positions of power, please" speech is interrupted with news of the goings-on in Egypt. 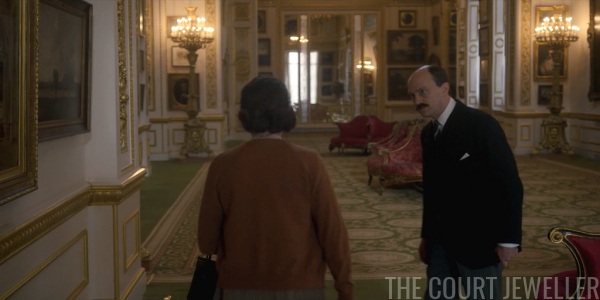 Back at Buckingham Palace, Elizabeth has gotten Philip a going-away present: a movie camera, the same thing that her father gave her before she departed for her honeymoon way back in season one. She goes to sneak the camera into his briefcase ... and discovers a sentimental photo of a gorgeous ballet dancer. Uh-oh. Eden tells her that things aren't looking good for the Suez Canal, but he has a brilliant solution: tell all of the British and French ship captains who know how to sail through the treacherous canal to stop working. Then no one can use the canal at all! HM is skeptical of Eden, as per usual, but goes along with it, as per usual. It's October 15, 1956, and Philip's Commonwealth tour is ready for its kickoff. At the airport in London, Mike Parker and his wife, Eileen, say a frosty goodbye. Also detached and stoic in her farewells: Elizabeth, who has brought Charles and Anne with her to say goodbye to their father. 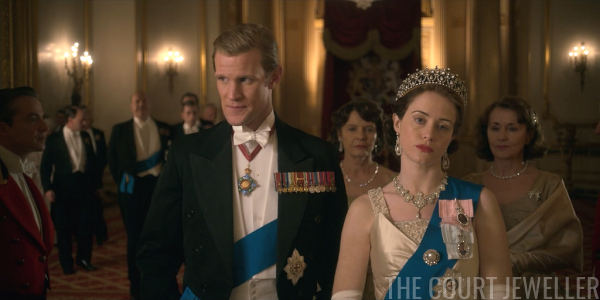 The production put her in their "ribbon" brooch; she appears to actually have worn one of her sapphire brooches, perhaps the Chrysanthemum. 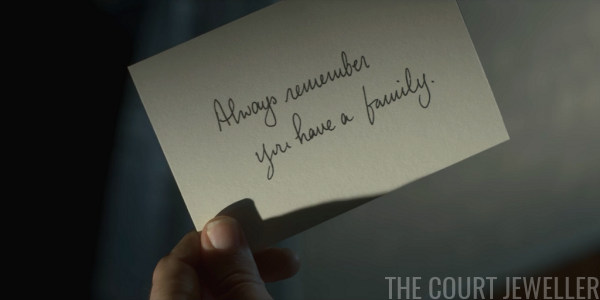 When his wife and children leave the plane, Philip finds the camera and his wife's note in his briefcase. Although Elizabeth wrote the note before finding the picture -- and therefore likely meant something warm and comforting in its tone -- it reads as a stark warning and accusation. A stoic and almost smug Elizabeth watches as the plane takes off. 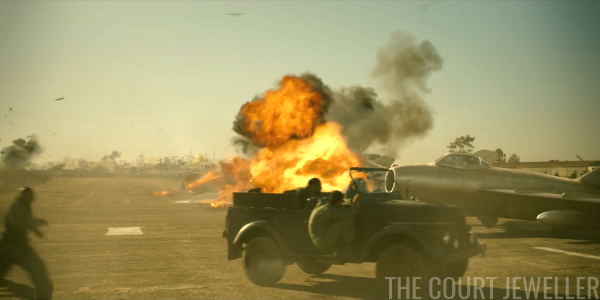 This shot is modeled on actual newsreel footage from the day. In reality, another member of the family accompanied them: Philip's sister, Princess Sophie of Hanover. Meanwhile, Eden's plan to stymie the Egyptians by taking away their pilots has backfired: the Soviets have begun training the Egyptians how to sail through the canal themselves. He dramatically flails about, sending his paperwork flying. As he stares angrily at his own reflection, you can almost hear his super-ego taunting, "Ain't never gonna be Churchill now!" 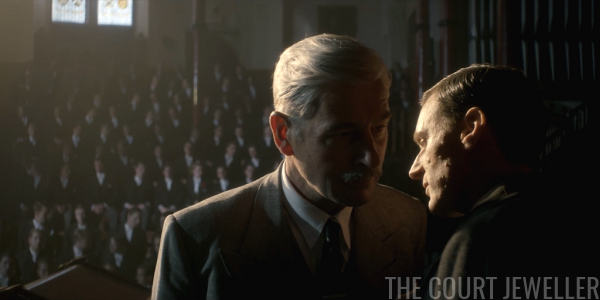 Eden summons the Chancellor of the Exchequer, so we get to meet our PM-in-waiting, Harold Macmillan, for the first time. (No breaking of tradition here -- Macmillan went to Eton and Oxford before fighting in World War I.) Eden tells Macmillan that they must go to war, so that Nasser won't be able to cut off their access to Middle Eastern oil. A quick war will also be helpful for Eden to get out of Churchill's shadow, they agree. Back at the palace, Elizabeth is in her pearls-and-brooch uniform to chat with her children before they head off to a birthday party. The birthday girl in question is Julie, Mike Parker's daughter. 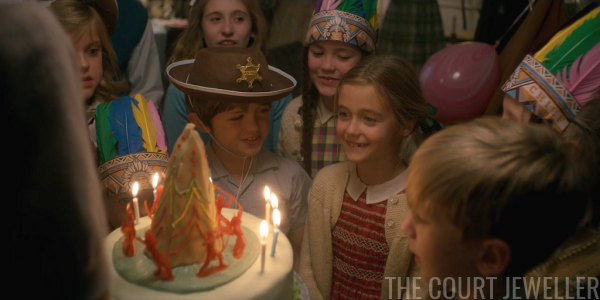 Charles and Anne attend her cringeworthy (but very period-appropriate) "Cowboys and Indians" birthday party, which includes a teepee cake that is both culturally and aesthetically off-putting. Also: Mike doesn't call to wish his daughter a happy birthday, which only makes Eileen's anger toward him deepen. 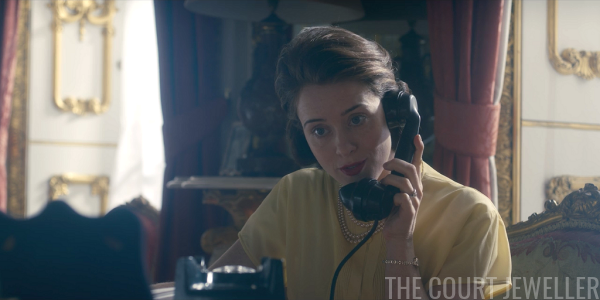 Over in Clarence House, Princess Margaret is awakened by a telephone call from her big sister, even though it's basically afternoon. 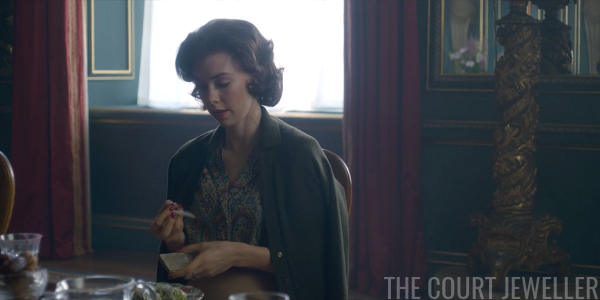 A pearly and sunny Elizabeth has found herself suddenly free, and wouldn't Margaret like to come to lunch? Margaret, grousing about being disturbed, eventually agrees. 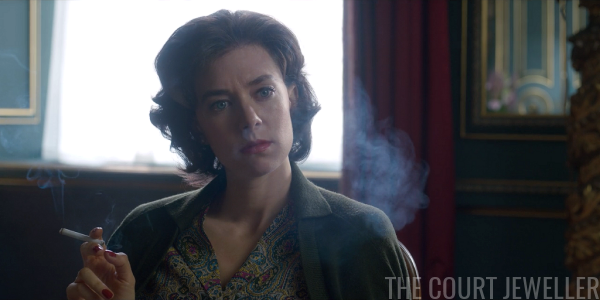 A ring on the middle finger of Margaret's left hand is her only visible jewelry as she fumbles with her cigarette case. She admits that she's still a little drunk from the night before. Show Margaret has apparently been wallowing post-Peter for some time (depending on what in the world the show wants to do with time, it's either been a year or like five days since the broken engagement). It's pretty lazy characterization, really: in October 1956, Real Margaret was also on a solo world tour, visiting British territories in East Africa, not drinking until four and then sleeping until noon. 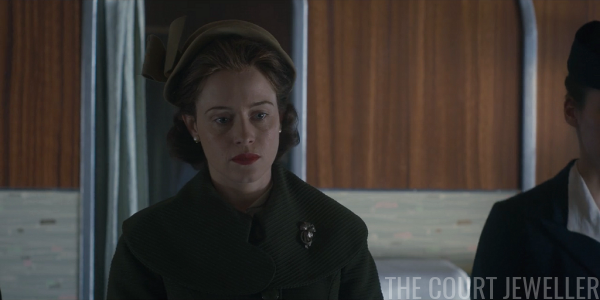 Margaret asks how Philip is, and when Elizabeth doesn't have an answer, Margaret unloads, bringing up Peter, and then dogging on Philip, and then dogging on Philip's family, including his "lunatic mother" (not cool) and his "Nazi sisters" (tough but fair). Another of Philip's family members, Lord Mountbatten, is being fitted for his latest uniform, now that he's Admiral of the Fleet. (That real-life appointment happened on October 22, 1956.) 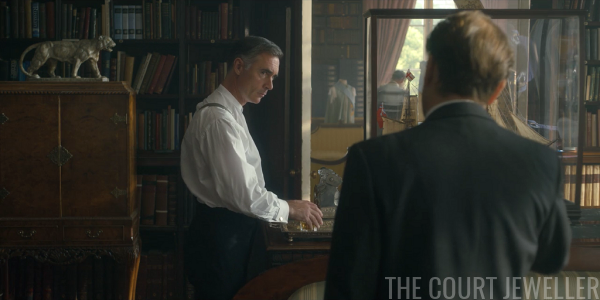 Note all of the interesting clutter in Uncle Dickie's Fancy Uniform Room, including the robes of the Order of the British Empire in the corner. Mountbatten is called away because he has a guest: Anthony Nutting, the Minister of State for Foreign Affairs. They run into Dickie's wife, Edwina, who is very elegant in pearls and a floral brooch. Right in front of Nutting, the Mountbattens trade barbs about Edwina' infidelity and Dickie's inadequacy. 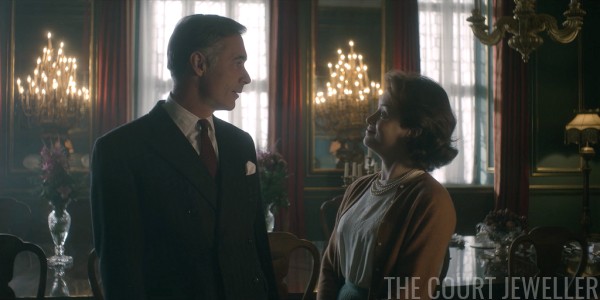 The show has decided to paint Dickie as the wounded party in the Mountbatten marriage, probably so that he can sympathize with Elizabeth in a subsequent scene. But it's so silly: both Dickie and Edwina had long-term extramarital partners: Yola Letellier and Harold "Bunny" Phillips. According to their daughter Pamela's autobiography, it was actually Edwina who struggled more with jealousy in their unique arrangement. BUT ANYWAY. 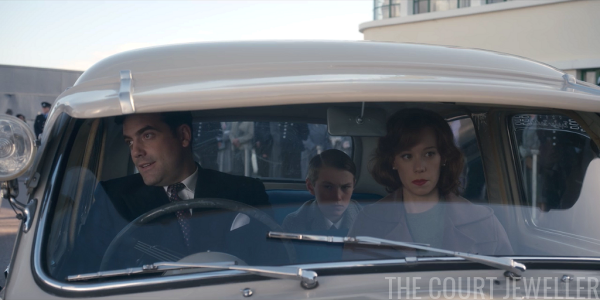 Dickie takes his concerns straight to the top by scheduling a dinner with his niece-in-law. 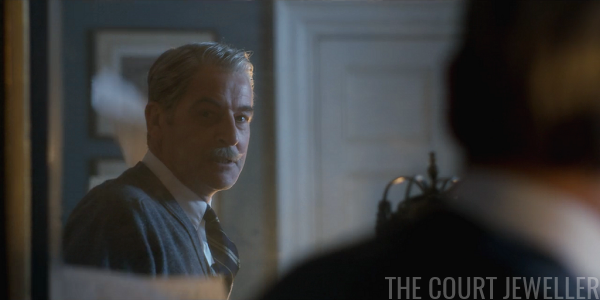 He warns her that she needs to pay more attention to the documents she's sent about Egypt. This part of the narrative really bugs me. 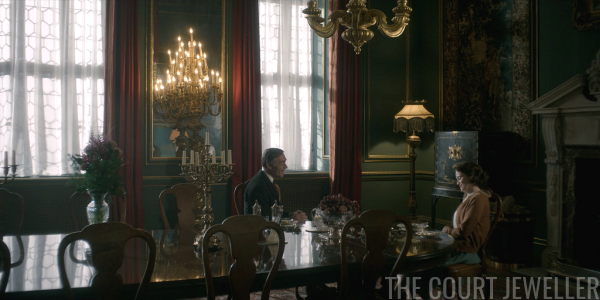 The show is legitimately suggesting that HM was too distracted by her worries about Philip's possible infidelities to do her job properly, which is pretty far-fetched. 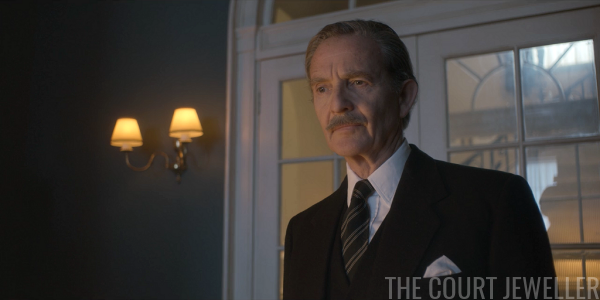 There are still lingering questions about how much the Queen knew about the Suez affair as it happened. Many historians believe that Eden hid at least some of his plans from her. Robert Lacey (using Lord Mountbatten as his source) claimed that the Queen "was genuinely surprised by what had been carried out in her name in October and November 1956," while Andrew Marr believes that "the Queen knew the essential story but that Eden deliberately held back the most embarrassing part of his plan from her, precisely in order to prevent her from being contaminated if it went wrong." 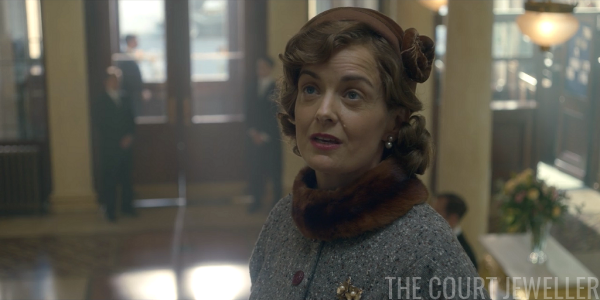 Regardless of what really happened, the show's storyline -- that Lord Mountbatten had to remind his niece to do her job, because she is too emotional to focus -- is grating. The show also has Dickie commiserate about what it's like to be cheated on, even bringing up Edwina's rumored affair with Nehru. 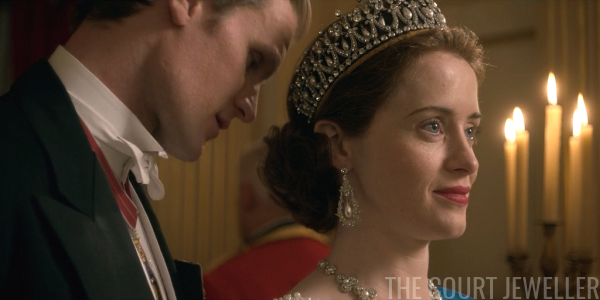 He says Philip is a "wild spirit," and Elizabeth will just have to learn to live with that. Whatever, Dickie. Elizabeth has to leave dinner early so that she can get to the ballet, where she's seeing Giselle. 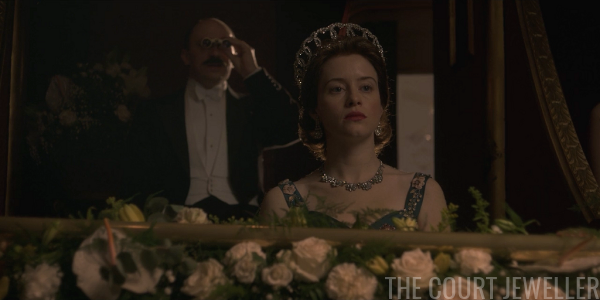 Do we think the production knows that the Vladimir Tiara is referred to as "widowed" when it's worn without drops? Because if they do, that's a pretty good jewelry commentary on a character's mental state. 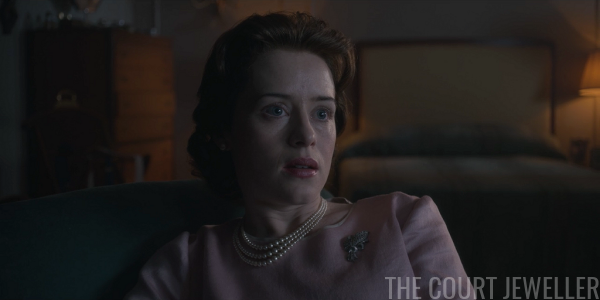 Elizabeth's wearing the tiara with a necklace and earrings invented by the production. Also, you've got to love Adeane in the back with the mustache and the opera glasses. 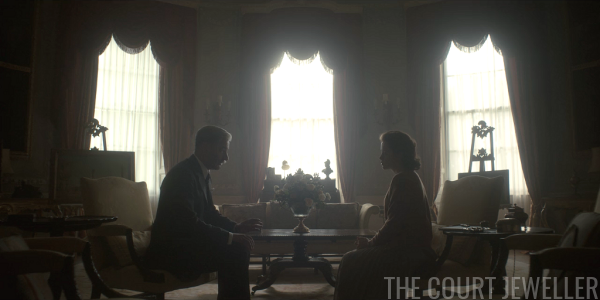 So, did Prince Philip really know Ulanova? The ballerina did make a celebrated series of appearances at Covent Garden in 1956, and she did perform Giselle during that trip. I don't think there's evidence that Philip and Ulanova ever had a relationship, but there are plenty of rumors that he was associated with other women. Royal biographers disagree about whether he was ever truly unfaithful. We'll probably never know. 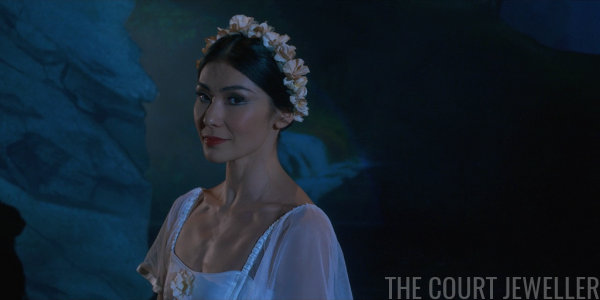 Adeane asks Elizabeth if she'd like to meet Ulanova. That's a hard pass from the Queen. 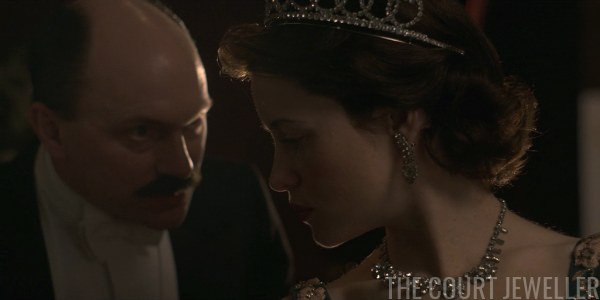 On a jewelry note, have a look at the strange, extended sides of the tiara. The real Vladimir doesn't have these, and I'm not sure what the replica was trying to achieve with them. Easier wear? 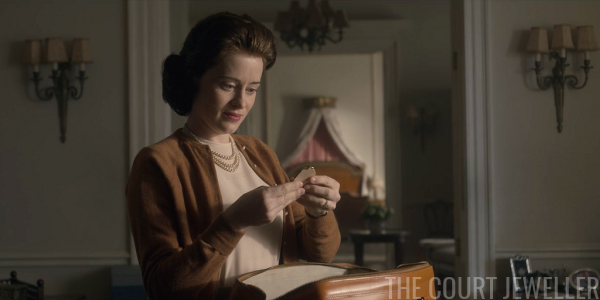 After the ballet, Elizabeth's jewels -- part of her "battle dress" -- are removed, and she's alone. 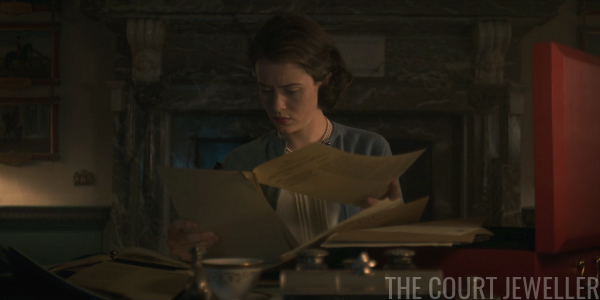 So she follows Uncle Dickie's advice and decides to Be Better At Reigning, starting with a good sort through various documents. One of them, helpfully, is boldly marked SECRET. She smells a rat. She calls Eden in, and he admits it: the Brits, the French, and the Israelis had a secret meeting outside Paris, where they agreed to the Protocol of Sèvres. Under their plan, the Israelis would invade Egypt on October 29, 1956. The next day, the Brits and the French would demand that both sides withdraw from the canal zone, and when they didn't, they would begin airstrikes. The Israeli invasion, then, was simply a ruse for inevitable airstrikes to occur. The war, Eden explains, "is to keep the peace." The Queen, who reinforces her royal jewel uniform by wearing pearls on her (production-invented) brooch, is horrified. 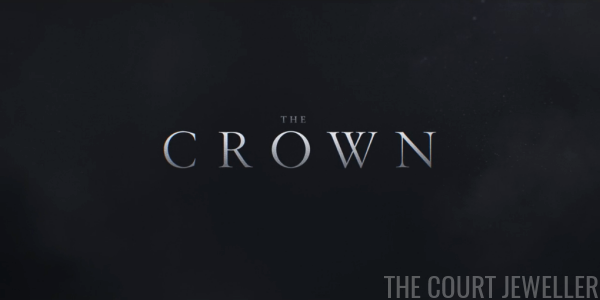 When Eden asks if he has her support for the plan, she hesitates, but she finally states that the prime minister always has the monarch's support. Of course, the airstrikes happen as planned. And the show reminds us that Eden was using prescription drugs very heavily during this period. Always good when you're plotting to hide your secret war plans from your allies and possibly your boss. 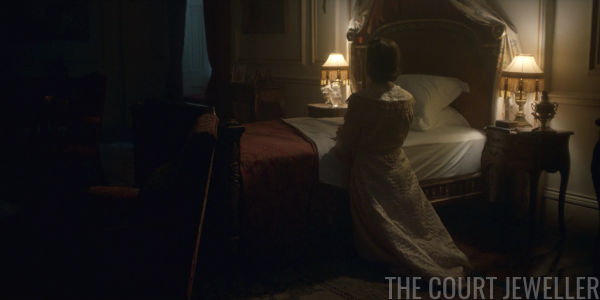 Elizabeth heads to bed, saying her prayers. She angrily closes the door between her side of the suite and Philip's before going to sleep. No spoilers for future episodes in the comments, please! 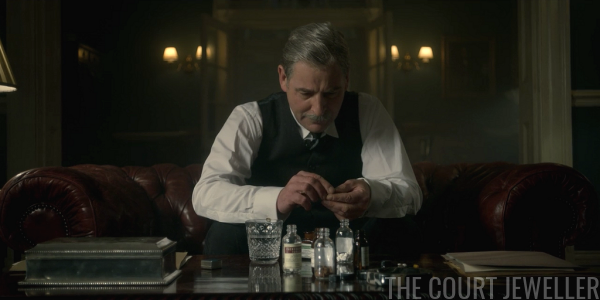 The next recap, which will cover episode two, "A Company of Men," will be posted on Thursday.